I’m overcome with dread when I begin a novel and realize that the author is invested in voice. Voice is presented as a such an integral aspect of the writing craft that we take for granted its importance. Of course it’s impossible to write anything that’s devoid of voice, but maybe you know what I’m talking about, that quirky randomness that desperately labors to force every sentence through a crucible of originality. Seeing if the author can keep pulling it off is as exhausting as watching a person balance atop a pillar on one leg for twenty-four hours. The moves that writers use to achieve such a tone are so limited—based mostly in non sequitur, catechresis, hyperbole, and relentless metaphor—that what begins as a gesture towards distinctiveness instead engulfs most of these projects in a larger homogeneity. “Her office is decorated more or less with the same uniqueness that actually amounts to blandness,” the eponymous protagonist of Gabe Habash’s novel Stephen Florida would seem to be alert to the literary equivalent of this superficial bravado. 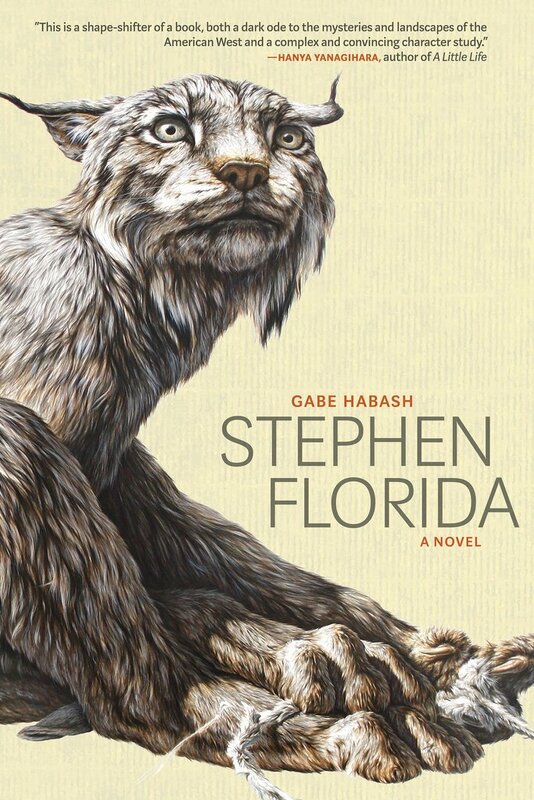 Stephen Florida is both a very voicey novel and a very experimental novel, so my constant question while reading it was the extent to which Habash’s marshaling of traditional craft-based voice was being used to subvert and critique its usual deployment. The big difficulty right away with the text is that the narrator, a monomaniacal college wrestler, simply wouldn’t write a novel. Nor would he think the type of thoughts that constitute Stephen Florida. As a bookish jock, I make this claim delicately, pointing to passages in which Stephen disparages literariness, for example, “Her eyes were brown and I’m not trying to be an uppity poet when I saw that the world shortly became more than a freezing ice ball,” a baffling sort of “no homo” reflex in a book so full of such attempts at artful strangeness and beauty. Not that academic and artistic skill always line up, but evidence from Stephen’s homework suggests that there’s an unbridgeable gulf between how alternatingly dim and erudite he comes across. After spending fifteen minutes on an excruciating final sentence of his Debating Human Rights in China paper, “‘The persistence of the Chinese’s indefatigable will, even in centuries, will still be remembered,’” he brims with pride over his accomplishment. “I believe that this sentence is the best sentence I’ve ever written… I cut the sentence out of the paper and taped it up over my desk.” The unlikelihood at the core of the narration is similar to the problem of found footage in a horror film. Can we think of an organic reason for a camera to be pointed at these events? Almost always it requires a bigger suspension of disbelief than should be asked of us. Tracking literariness or intellectualism through the book also yields some loaded connections. To some degree, Stephen Florida is an investigation into the deviancy of the hyper-competitive American male, albeit from a point of view that is itself fucked up to the point of utter untrustworthiness, but it seems important that the plot keeps falling back to something resembling pedophilia for its introduction of conflict. Not once, not twice, but three times Stephen has a near brush with a predatorial adult male—and in every case the forbidden appetites seem linked to the characters’ intellectualism. One of the wrestling coaches, Roland Fink, who is prone to quoting Roland Barthes on the marker board with enough familiarity to omit the theorist’s first name, uses his coaching notebook to create a David Shields-esque collage of appropriation that Stephen takes it upon himself to deriddle in hopes of uncovering Fink’s plot to kill his wife, instead leading Stephen to discover Fink’s sexual abuse of his wrestling teammate and best friend, Linus. Stephen’s Jazz Appreciation teacher, Levi Silas, is brimming with smart things to say about life and music, but really he just wants to get Stephen drunk and take him back to his house (the same house in which Silas potentially did kill his wife). Even a guy named Shane, who orients Stephen to potential future employment at an oil field, is distinguished from his coworkers by moments of woke insight—“People end up in a new situation, they don’t act like themselves. People are animals. Men, really, is who I mean.”—as well as by a book on the shelf of his horror-movie-setting of a house called The Original of Man that discloses—like Fink’s notebook—a seething froth of sexual violence underneath the surface of American normalcy. Especially since the novel ends with an extended blow-by-blow description of Stephen’s final matches at nationals—as if sports were why readers picked up the book—it seems like the novel is presenting physicality and athletics as a better alternative over the hazards of abstract/artistic thought. I don’t think that such an easy binary is Habash’s actual intention (he might have even been going for the opposite), but it’s during Stephen’s injury, when he’s given time away from his sport to do nothing but think, that he engages in his most aberrant behavior and the text likewise indulges in its most innovative movements, again seeming to posit artistic expression or at least excess as an exacerbation of destructive libidinal tendencies. I can’t not see a throughline between The Original of Man, Fink’s green notebook, and the prose of Stephen Florida. I’ve offered a lot of critique about a book I actually loved—and likely my ability to do so is because of the significant risks it takes, its high stakes. A book about youth athletics in America requires a disease at its core that precludes it from entertaining a reader in traditional ways. Although it’s packaged ready-to-consume, Stephen Florida demands to be treated as a wild rule breaker resistant to all comfortable reading strategies. Readers should approach Stephen Florida ready to view its inconsistencies of character, its ethical messiness, and its refusal to resolve so many of its disparate plotlines as a subversion of the voice-based, masculine coming-of-age novel rather than an unsuccessful attempt to participate in that genre’s more oblivious reflexes and oversights. JOE SACKSTEDER's first collection, Game in the Sand, is forthcoming from Sarabande in 2019, and his album of Werner Herzog audio collages, Fugitive Traces, is available from Punctum Books. He's a PhD candidate at the University of Utah where he's managing editor of Quarterly West. Find more work online at Hobart, The Rumpus, The Florida Review, and Passages North.